Remote provides a live display of Power Manager on your Mac. What you see and do on Remote is synchronised immediately with your Mac. Once connected to a Mac, Remote displays a series of views showing different aspects of Power Manager. These views are listed at the bottom of the screen as tabs. Tap on a view's name and icon to change to that view. 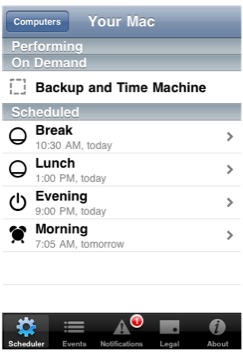 The Scheduler view presents an insight into Power Manager's scheduling state. The view is live and will automatically update as events are triggered and perform. The Performing section shows the events that are currently performing or whose conditions are currently being evaluated. The On Demand section shows events that can be performed manually by an appropriately authorised user. Tap an event in the On Demand section to trigger it. The Scheduled section shows Power Manager's queued triggers. The queue is ordered by date. Tap a queued trigger in the Scheduled section to view options for adjusting the trigger. See the section called “Queued Trigger”. Tap on the event's row in the On Demand section. Tap Trigger Now to confirm the event should be triggered immediately. Tap on pending trigger's row in the Scheduled section. See the section called “Queued Trigger”. Swipe the pending trigger's row in the Scheduled section from right-to-left. Swipe the pending trigger's row in the Scheduled section from left-to-right. Tap on the Computers button. A Computers view will appear. Tap on the computer to switch to.